Rental available all year, for weeks and weekends (price depends on duration of the stay), for weddings, family reunions, bachelorette parties, congresses, festivals, concerts, competitions (golf, surfing, horse riding). The walks on the forest are a delight in any season and during autumn you will see mushrooms and chestnuts across your path. Lake Saint Pee is 15 minutes away; there you will find activities to do with your family like swimming, bikes, games and restaurants. The Irati Hall (an exhibition room) is at 10 minutes from the house, there are exhibitions, fairs all year round on Biarritz. This region is perfect for weddings, family celebrations, to surprise your friends and family, but this residence is not fully equipped, neither is it too small but it is perfect for everyone. You can go to Rhune on foot, bike or train. Two very spacious and comfortable bathrooms: The blue bathroom is equipped with a washbasin, a bidet and a bathtub. The pink bathroom is equipped with a washbasin, a bidet, a shower and a window on toilet so you can see the street and the beautiful Basque homes (closed street). The bedroom with the 190cm bed has a toilet, a washbasin and a bidet. 3 toilets, 2 independent bathrooms. Linen can be rented (towels and bath towels). The garden is enclosed with a shaded terrace; you will find 14 chairs, 3 tables, 3 chairs and 1 barbecue Baby equipment: a cot, a high chair, two changing tables, a bath and 2 pots Harwood floors in all bedrooms, living and dining room, tiles in the kitchen, carpet in the bathroom 2 televisions, one is a flat screen. The washing machine can be rented, please ask at the time of booking. 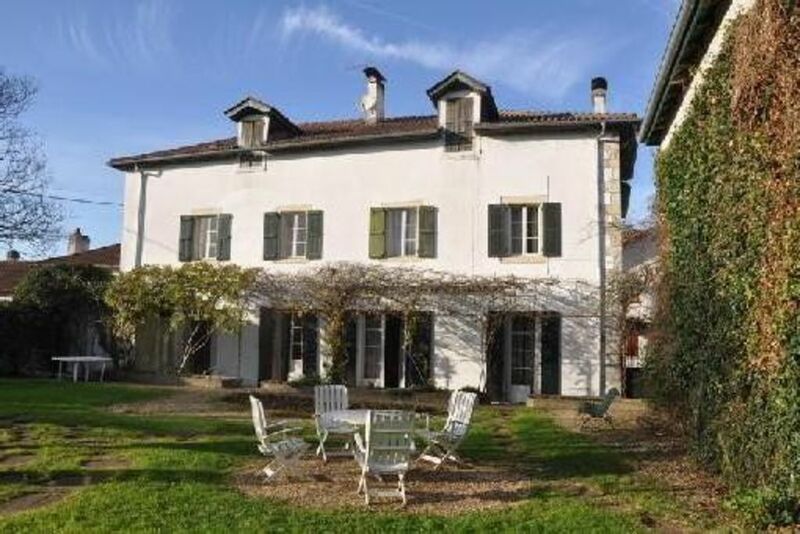 Maison accueillante pour vacances familiales. Excellent accueil de notre hôtesse. La maison est spacieuse, et le jardin très agréable, particulièrement adapté pour des petits enfants. Nous avons passé en famille (nombreuse) une semaine de vacances réussie pour tous. Nous avons tous pu nous retrouver en famille sur 3 générations. La maison et grande et accueillante, et la propriétaire nous a accueillis avec beaucoup de gentillesse et un grand sourire. Maison très agréable, spacieuse, bien équipée, confortable avec jardin immense et magnifique. Nous y avons résidé à 7 adultes/8 enfants sans être les uns sur les autres. La propriétaire est très accueillante et disponible. A relative proximité des plages basques (20-25 minutes en voiture pour aller à Bidard) mais loin du tumulte du bord de mer. Seul petit défaut, il manquerait un sèche linge pour parfaire l'équipement de cette belle propriété. Excursions in the Basque Country: take a train to Saint Jean Pied de Port, explore the valley of Nive and the forest of Irati at 45 min.